Academia de Cruz Medina: I Made a Library Search! I Made a Library Search! Just this afternoon, I was reading the most recent issue of Composition Studies ;there's an interesting article by a creative writing professor Rachel Peckham, "The Elephants Evaluate: Some Notes on the Problem of Grades in Graduate Creative Writing Programs," discussing the grading practices, philosophies and responses of grades in creative writing seminars. Peckham makes some interesting points about the disconnection between grades and publish-ability because acceptance rates at literary magazines and presses is much, much lower than the high rate of A's awarded in creative writing seminars. 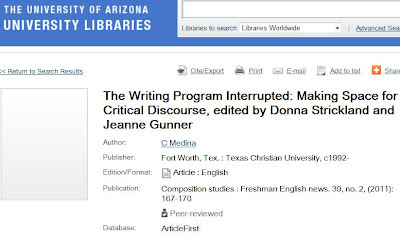 Speaking of the most recent issue of Composition Studies, I posted on the book review I wrote, but as I was trolling the UA library website, I ran across my review. 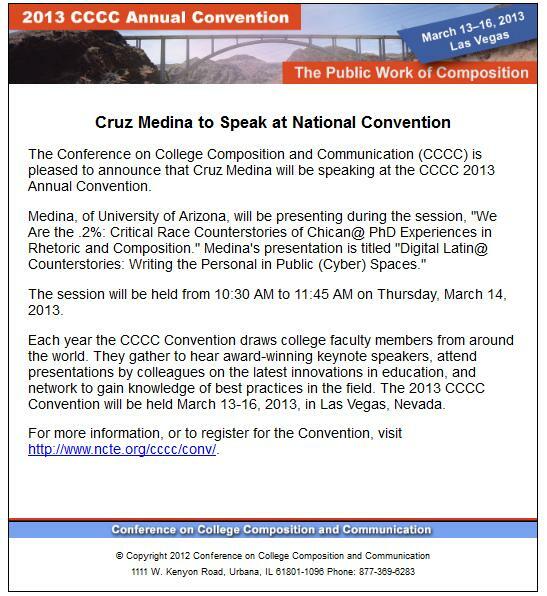 Despite the fact it has me as "C Medina" with a link to all kinds of other texts that aren't mine, it's still feels cool. Or check it out here. 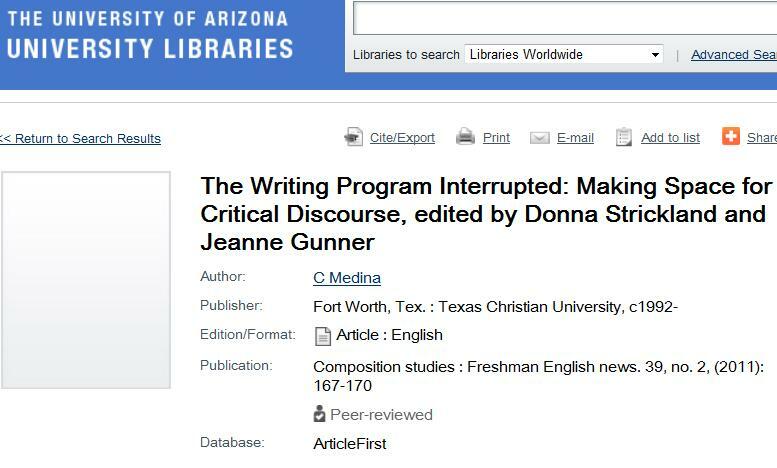 Medina, C. "The Writing Program Interrupted: Making Space for Critical Discourse, Edited by Donna Strickland and Jeanne Gunner." Composition Studies : Freshman English News. 39.2 (2011): 167-170. Print. The book I co-edited is also in the UA library site, but it's nice to get listed. This We Believe = Nuestros Refranes: Words to Live by from the Class of 2012 Cholla, Desert View, Pueblo and Sunnyside High Schools. Tucson, Arizona: University of Arizona and Sunnyside High School and Tuncson Unified School District, 2010. Print. Another Attempt at "Digital Storytelling"